The Virgins parade through the city. On Cusco sidewalks, in parks and plazas, their faces brush against businessmen, beggars, girls in plaid skirts with schoolbags slung over their shoulders. 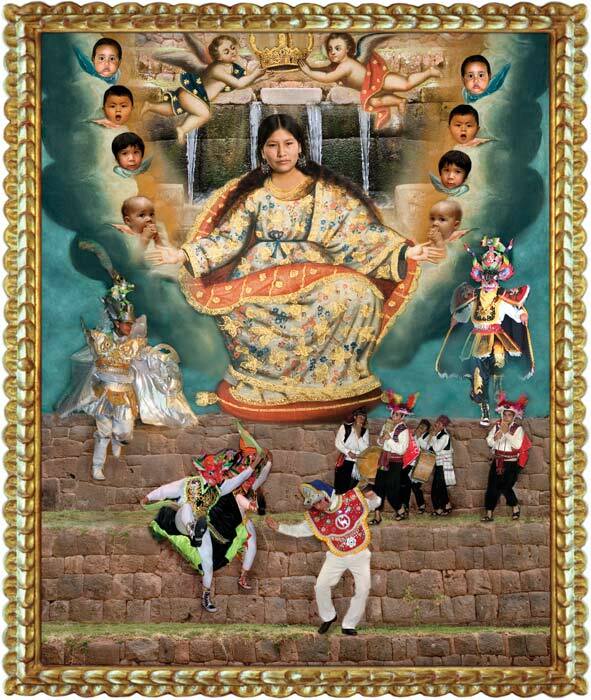 Someone may look up and see Our Lady of Cocharcas enthroned above the curb or ducking down a cobblestone alleyway, baroque wings flapping. Saint Rose of Lima may bump into a woman carrying groceries as the streetlight changes. 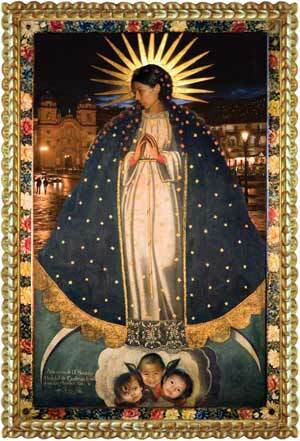 Spanish colonial art is famous for its Virgins. Peruvian-born artist Ana de Orbegoso wanted to create a series of images that would both pay tribute to and critique that tradition. 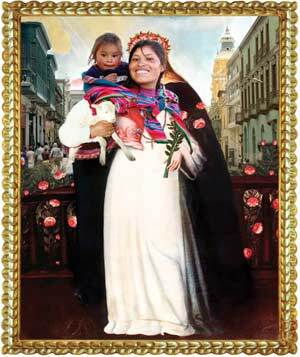 She appropriated Spanish images of the saints and Virgins, and then used modern photographic techniques to replace the docile, European faces with the faces of the Peruvian women of today. Her giclée prints superimpose the new over the old, the empowered over the objectified, drawing attention to both. But, instead of confining the works in art galleries, de Orbegoso wanted to make the Virgins a part of the modern landscape—Urban Virgins. 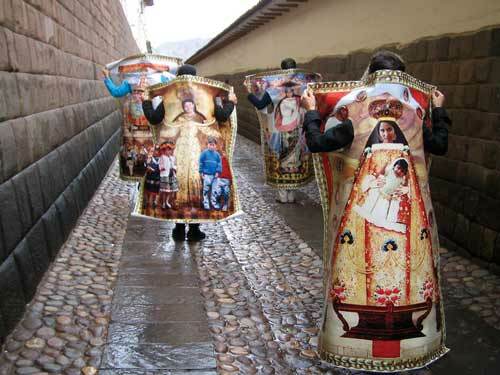 She turned copies of each collage into a costume for her accomplices to wear on a walking tour of Cusco. Picture an unlucky employee lumbering between sandwich boards, and you’ll have some idea of the scene, but instead of advertisements they’re walking works of art. By this juxtaposition of colonial imagery with city environments, de Orbegoso hoped to show that these icons were never part of the world they inhabited. Instead, they embodied, and were used to impose, European values and standards on the conquered Americas. 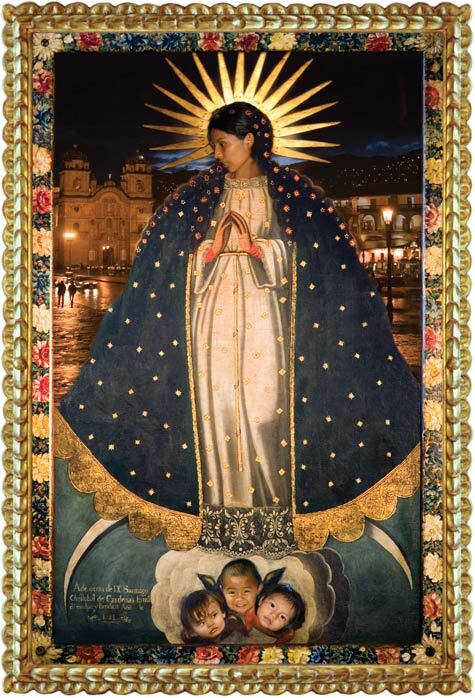 According to de Orbegoso, the colonial Virgin was propaganda, promoting “the ideals to which native women were supposed to strive—purity, benevolence, and compliance.” Like the Holy Mother, they should be blank, silent, and, preferably, as white as possible. Imperial conquest is more than physical subjugation; it colonizes bodies, minds, and—most dangerously—imaginations. Along with muskets and disease, the Spanish brought their language, their religion, and their culture. Colonized artists, de Orbegoso says, were forced to reject their native art forms in order to mimic the Spanish style. Express yourself, if you must, the Spanish said, but our way, not yours. In Urban Virgins, de Orbegoso rejects the oppressive legacy of colonial vision by replacing the anonymous saints with photographs of living women. In place of the ideal, she offers the real—a new kind of icon. While the colonial Virgin was a static representation of a complex reality, de Orbegoso’s Virgins embody the intricacies of South America, of Peru, of Cusco, which she calls a “fusion of European and indigenous cultures . 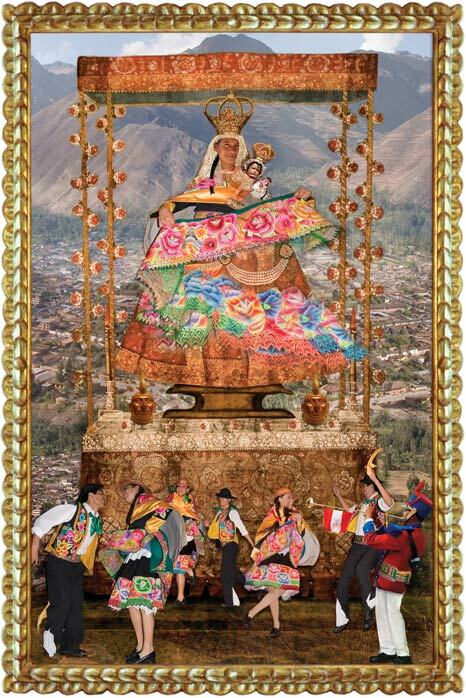 . . where colonial structures superimpose Inca walls, and Christian beliefs coexist with Andean spirituality.” The Virgins are surrounded by trappings of the old and new, symbols of prosperity, poverty, celebration, and tragedy. 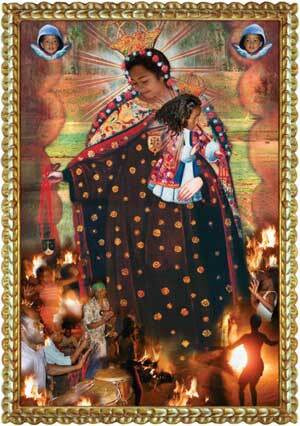 At their feet: flames and flowers, dancers, begging children, escaped slaves. The Virgin of Mercy justifies this shift from the ideal to the real. The art of the colonial era offered the Americas “fat little angels carrying banners” and meek white women—art that was lying to itself and its audience. 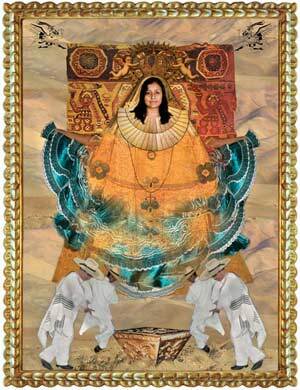 The collaboration of de Orbegoso and Gonzales, by contrast, honors the genuine flesh-and-blood women of Peru. 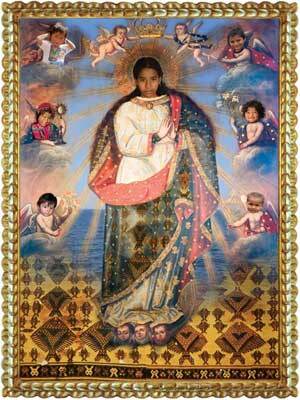 It recognizes the real “little martyrs of Almudena temple,” the “street-working children,” the empowered and the needy. Colonial art celebrated “seraphim playing lute[,] . . . misty distances” instead of meaning, but these Virgins offer a better kind of Mercy—the love of what exists, the worship of what we are—art in action, women in the world. I am Rosa. Florist of Five Corners. Gate of flowers. Not the Child of the Thorns. Or is it? No el Niño de la Espina. ¿O sí?. que patea y clama: teta. velak yanayasqan Moreneta mamachachu kani. Rosan noqaqa kani. the anonymous artisan of Pampachiri? Imarayku t’ika pilluy, chay sumaqyasqa k’illkichakunapas kaypi? the Callejon de Huaylas from the Cuesta de Animas. Switchbacks. el Callejón de Huaylas desde la Cuesta de las Animas. Cimbral. buscador de tapados, vivandera. . .
designer of the Florentine school? fat little angels carrying banners? seraphims playing lute, trumpet-playing angels? ¿gordos angelillos desnudos portando cartelas? ¿serafines tocando laúdes, ángeles trompeteros? ¿Florentina yachay wasimantachu kanman icha? ¿waqra phukuq serafinkunachu, arpa maywiqkunachu? ¿danzante de las pandillas de Caracoto? ¿Karaqotomanta tusuq q’achurichu kayman icha? Cusco. Plaza de Armas, 2 a.m. Heavy trucks go back and forth in my memory. Via Crucis. at midnight? Where are the backpackers and the VIP tourists? of the Holy Drinkers of Plaza Regocijo? And the Yauri herders? And the Quiquijana potters? And the United Union of Silversmiths and the Guilders of San Blas? Who knows? the fanatic widows who call me the Beauty of the Cathedral ask for me. at the Ukukus bar? Do they drink double inka shots in the Kamikaze? Do they start flying at Mile Zero, in the whorehouse of Santutis? Cusco. Plaza de Armas, 2.a.m. Pesados camiones zigzagean en mi memoria. Vía Crucis. de medianoche? ¿Dónde mochileros y turistas VIP? de los Santos Bebedores de la Plaza Regocijo? ¿Y los troperos de Yauri? ¿Los olleros de Quiquijana? Alzan vuelo en Kilometro Cero, en Santutis? Waqaypata Qosqo llaqta. Pacha illariy. Llasan llasan kamiyunkuna umayman muyumun. Muchuy ñan. ¿Maytaq lluy qatichupaykunari? ¿Maypin kuskatuta layma puriqmasiykuna? ¿Maypitaq chay p’aqoyusqa wasa q’epikunari? ¿Maypi qolqeyoq puriqkuna? Yawri maqt’akuna? ¿May Kikihana manka llut’aqkuna? ¿Chay Sanblasmanta qori, qolqe takay kamayoqkuna, maypin? Yanqa. Ichachu musphayashanku Kilometro Seropi, Santutispi? Ana de Orbegoso was born in Peru in 1964. Her work has received the En Foco New Works Photography Award and first prize in this year’s Fotografia Peruana competition. 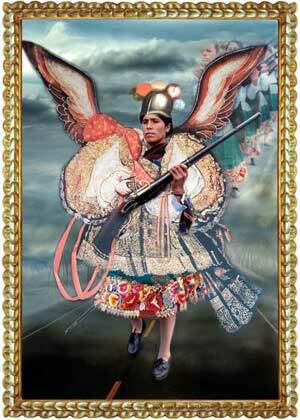 Odi Gonzales was born in 1962 in Cusco, Peru, where he grew up speaking both Quechua and Spanish. He has published five books of poetry in Spanish: Child’s Play (1988), Sacred Valley (1993), Souls in Pain (1998), Tunupa: The Book of the Sirens (2002), and The Cusco School (2005). His numerous awards include the César Vallejo Poetry Prize and the Premio Nacional in Poetry. He lives in Cajamarca, Peru, where he is completing a doctoral dissertation on the Quechua Oral Tradition.